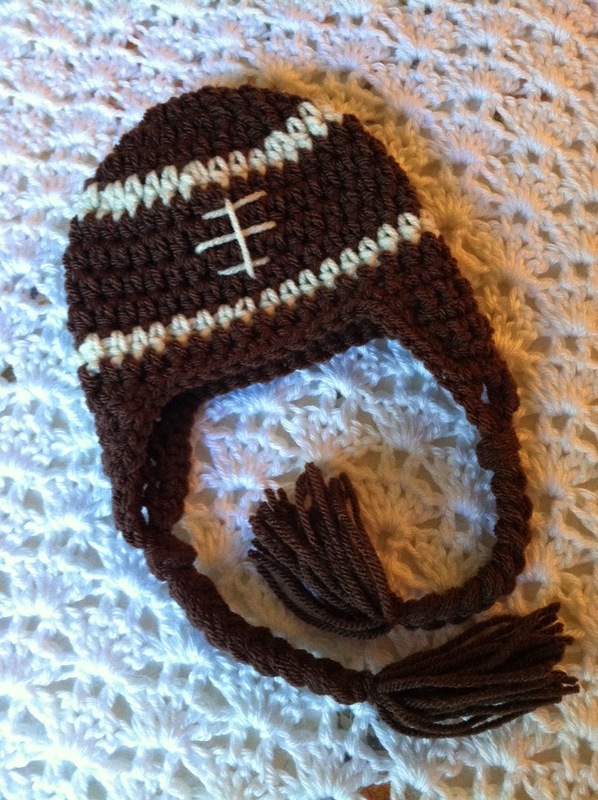 Lakeview Cottage Kids: Crochet Football Earflap Hat FREE Pattern!!! Sizes 0 - 3 Months to Adult! Crochet Football Earflap Hat FREE Pattern!!! Sizes 0 - 3 Months to Adult! It is the middle of July and the temperatures should be in the 80's! But, here in the Midwest, it has been a different story! We are in the middle a very cool week in July! It was 54 degrees here last night! And, because of that, I started thinking of fall and the coming of football! So.....here is my new free pattern so that we can all get ready for the real fall football season! 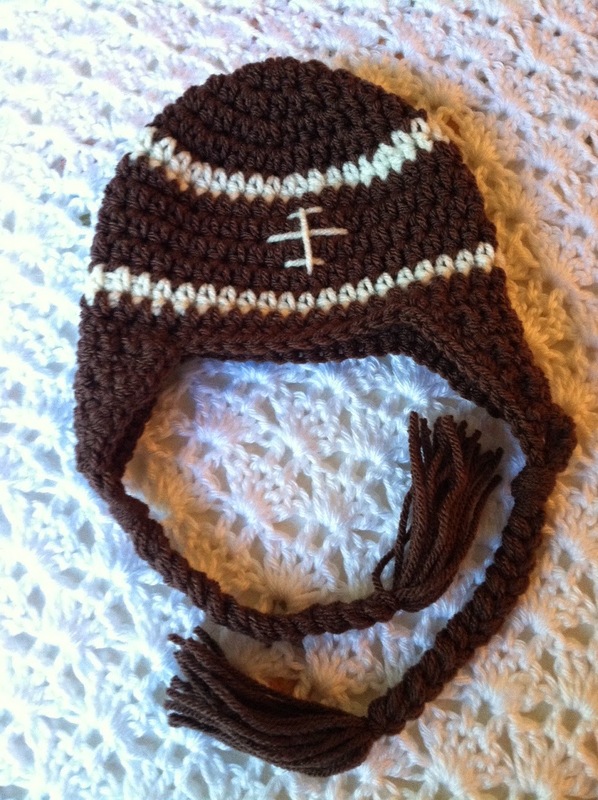 My pattern is made with Lion Brand "Vanna's Choice" Yarn in two colors, Chocolate and Cream! For Babies, Toddlers, Children, Teens and Adults!!! *****Be sure to check your gauge for this pattern!!! I crochet loosely so you really need to check gauge and select the correct hook size to make this hat!! Thanks! Round 2: Ch 1. Work 2 hdc in next stitch and in each stitch around. Join to first hdc with slip stitch. Round 5: (Change to Color B – Cream) Ch 1. *Work 1 hdc in next 3 stitches. Work 2 hdc in next stitch. * Repeat from * to * around Join to first hdc with slip stitch. Round 6: (Change back to Color A – Chocolate) Ch 1. Work 1 hdc in each stitch around. Join to first hdc with slip stitch. Round 7 - 9: Repeat Round 6. Round 10: (Change to Color B – Cream) Ch 1. 1 hdc in each stitch around. Join to first hdc woth slip stitch. Round 11: (Change back to Color A – Chocolate) Ch 1. Work 1 hdc in each stitch around. Join to first hdc with slip stitch. Ch. 1. DO NOT fasten off yarn. Continue on to Earflap #1. Row 1:. (You should be working on the right side of the hat.) Sc in same stitch as Ch 1. Sc in next 9 sc. (10 sc) Ch 1. Turn. Row 2: (You should now be working on wrong side of earflap.) Sc2tog, sc in next 6 sc, sc2tog. (8 sc) Ch 1. Turn. Row 3: (You should be working on the right side of the earflap.) Sc in next 8 sc. (8 sc) Ch 1. Turn. Row 4: (You should be working on the wrong side of earflap.) Sc2tog, sc in next 4 sc, sc2tog. (6 sc) Ch 1. Turn. Row 5: (You should be working on the right side of the earflap.) Sc in next 6 sc. (6 sc) Ch 1. Turn. Row 6: (You should be working on the wrong side of earflap.) Sc2tog, sc in next 2 sc, sc2tog. (4 sc) Ch 1. Turn. Row 7: (You should be working on the right side of the earflap.) Sc in next 4 sc. (4 sc) Ch 1. Turn. Row 8: (You should be working on the wrong side of the earflap.) Sc2tog, sc2tog. (2 sc) Ch 1. Turn. Row 9: (You should be working on the right side of the earflap.) Sc in the first sc. Ch 2. (The Ch 2 will create the space for the braid to be attached to the hat.) Sc in second sc. ****To determine placement of the second earflap, with right side out, fold hat so that first earflap is folded in half and you are looking at the front of the hat. The first earflap will be on the left as you look at the hat. From the fold on the right side of the flattened hat, count 5 stitches to the left (toward the center front of the hat). Place a stitch marker in that stitch. Attach yarn to that stitch. Working on right side of hat and following directions for Earflap #1, complete Earflap #2. Do Not Fasten off yarn. Continue on to Edging for All Around Hat and Both Earflaps. (Use Color A - Chocolate) Sc in each stitch all the way around the hat. Ch 1. Fasten off. Weave in all loose ends on hat. Choose yarns in one or both of the two colors used in the hat. In my example, I have used Color A – Chocolate only. 1. If using one color, cut 12 24-inch lengths of yarn. 3. If using two colors, cut 6 24-inch lengths of yarn in each color. 5. Fold the group in half. 6. With the right side of the earflap facing you and using your crochet hook, pull the folded end of the yarn group through the Ch 2 space in the last row of sc at the bottom of the earflap. Pull it from right side to wrong side. Put the other end of the yarn group through the loop and pull tightly. The group of yarns is now attached to the earflap. 7. Because you folded the 12 yarn lengths in half, you now have 24 yarns to use to make your braid. Divide the 24 into 3 groups of 8. (You can decide how to divide up the colors. You can just leave them random or divide as you wish.) Braid the yarn until you get to 2 ½ inches from the end of the yarn. 8. Cut another length of yarn (in either color) and wrap 3 times around the braid. Pull tight and knot twice to hold braid from unraveling. Trim bottom of braid leaving approximately 2 inches of unbraided yarn below the knot. Repeat directions used to make Braid #1. Fasten off yarn and weave in loose ends. Using Color B – Cream and the yarn needle, sew the laces, 1 horizontal and 3 across. (Refer to photograph for placement.) Fasten off yarn and weave in loose ends. Round 5: Ch 1. *Work 1 hdc in next 3 stitches. Work 2 hdc in next stitch. * Repeat from * to * around Join to first hdc with slip stitch. Round 6: (Change to Color B – Cream) Ch 1. *Work 1 hdc in next 4 stitches. Work 2 hdc in next stitch. * Repeat from * to * around Join to first hdc with slip stitch. Round 7: (Change to Color A – Chocolate) Ch 1. Work 1 hdc in each stitch around. Join to first hdc with slip stitch. Round 8 - 10: Repeat Round 7. Round 11: (Change to Color B – Cream) Ch 1. Work 1 hdc in each stitch around. Join to first hdc with slip stitch. Round 12: (Change to Color A – Chocolate) Ch 1. Work 1 hdc in each stitch around. Join to first hdc with slip stitch. Ch. 1. DO NOT fasten off yarn. Continue on to Earflap #1. Round 6: Ch 1. *Work 1 hdc in next 4 stitches. Work 2 hdc in next stitch. * Repeat from * to * around Join to first hdc with slip stitch. Round 7: (Change to Color B – Cream) Ch 1. *Work 1 hdc in next 6 stitches. Work 2 hdc in next stitch. * Repeat from * to * around Join to first hdc with slip stitch. Round 8: (Change to Color A – Chocolate) Ch 1. Work 1 hdc in each stitch around. Join to first hdc with slip stitch. Round 9 - 12: Repeat Round 8. Round 13: (Change to Color B – Cream) Ch 1. Work 1 hdc in each stitch around. Join to first hdc with slip stitch. Round 14: (Change to Color A – Chocolate) Ch 1. Work 1 hdc in each stitch around. Join to first hdc with slip stitch. Ch. 1. DO NOT fasten off yarn. Continue on to Earflap #1. Row 1:. (You should be working on the right side of the hat.) Sc in same stitch as Ch 1. Sc in next 11 sc. (12 sc) Ch 1. Turn. Row 2: (You should now be working on wrong side of earflap.) Sc2tog, sc in next 8 sc, sc2tog. (10 sc) Ch 1. Turn. Row 3: (You should be working on the right side of the earflap.) Sc in next 10 sc. (10 sc) Ch 1. Turn. Row 4: (You should be working on the wrong side of earflap.) Sc2tog, sc in next 6 sc, sc2tog. (8 sc) Ch 1. Turn. Row 5: (You should be working on the right side of the earflap.) Sc in next 8 sc. (8 sc) Ch 1. Turn. Row 6: (You should be working on the wrong side of earflap.) Sc2tog, sc in next 4 sc, sc2tog. (6 sc) Ch 1. Turn. Row 7: (You should be working on the right side of the earflap.) Sc in next 6 sc. (6 sc) Ch 1. Turn. Row 8: (You should be working on the wrong side of the earflap.) Sc2tog, sc in next 2 sc, sc2tog. (4 sc) Ch 1. Turn. Row 9: (You should be working on the right side of the earflap.) Sc in next 4 sc. (4 sc) Ch 1. Turn. Row 10: (You should be working on the wrong side of the earflap.) Sc2tog, sc2tog. (2 sc) Ch 1. Turn. Row 11: (You should be working on the right side of the earflap.) Sc in the first sc. Ch 2. (The Ch 2 will create the space for the braid to be attached to the hat.) Sc in second sc. ****To determine placement of the second earflap, with right side out, fold hat so that first earflap is folded in half and you are looking at the front of the hat. The first earflap will be on the left as you look at the hat. From the fold on the right side of the flattened hat, count 6 stitches to the left (toward the center front of the hat). Place a stitch marker in that stitch. Attach yarn to that stitch. Working on right side of hat and following directions for Earflap #1, complete Earflap #2. Round 2: Ch 1. Work 2 hdc next stitch and in each stitch around. Join to first hdc with slip stitch. Round 7: (Change to Color B – Cream) Ch 1. *Work 1 hdc in next 5 stitches. Work 2 hdc in next stitch. * Repeat from * to * around Join to first hdc with slip stitch. Round 9 - 13: Repeat Round 8. Round 14: (Change to Color B – Cream) Work 1 hdc in each stitch around. Join to first hdc with slip stitch. Round 15: (Change to Color A – Chocolate) Ch 1. Work 1 hdc in each stitch around. Join to first hdc with slip stitch. Ch. 1. DO NOT fasten off yarn. Continue on to Earflap #1. 1. If using one color, cut 12 32-inch lengths of yarn. 3. If using two colors, cut 6 32-inch lengths of yarn in each color. Using Color B – Cream and the yarn needle, sew the laces, 1 horizontal and 4 across. (Refer to photograph for placement.) Fasten off yarn and weave in loose ends. Round 7: Ch 1. *Work 1 hdc in next 5 stitches. Work 2 hdc in next stitch. * Repeat from * to * around Join to first hdc with slip stitch. Round 8: (Change to Color B – Cream) Ch 1. *Work 1 hdc in next 6 stitches. Work 2 hdc in next stitch. * Repeat from * to * around Join to first hdc with slip stitch. Round 9: (Change to Color A – Chocolate) Ch 1. Work 1 hdc in each stitch around. Join to first hdc with slip stitch. Round 10 - 15: Ch 1. Work 1 hdc in each stitch around. Join to first hdc with slip stitch. Round 16: (Change to Color B – Cream) Ch 1. Work 1 hdc in each stitch around. Join to first hdc with slip stitch. Round 17: (Change to Color A – Chocolate) Ch 1. Work 1 hdc in each stitch around. Join to first hdc with slip stitch. Ch. 1. DO NOT fasten off yarn. Continue on to Earflap #1. Round 8: Ch 1. *Work 1 hdc in next 6 stitches. Work 2 hdc in next stitch. * Repeat from * to * around Join to first hdc with slip stitch. Round 9: (Change to Color B – Cream) Ch 1. *Work 1 hdc in next 7 stitches. Work 2 hdc in next stitch. * Repeat from * to * around Join to first hdc with slip stitch. Round 10: (Change to Color A – Chocolate) Ch 1. Work 1 hdc in each stitch around. Join to first hdc with slip stitch. Round 11 - 16: Ch 1. Work 1 hdc in each stitch around. Join to first hdc with slip stitch. Round 17: (Change to Color B – Cream) Ch 1. Work 1 hdc in each stitch around. Join to first hdc with slip stitch. Round 18: (Change to Color A – Chocolate) Ch 1. Work 1 hdc in each stitch around. Join to first hdc with slip stitch. Ch. 1. DO NOT fasten off yarn. Continue on to Earflap #1. I don't know what I'm doing wrong but when I used this pattern I was trying to make the 12 month to 3 year size and it turned out a 0-3 month size. Way too small for my two year old but still cute. Pattern not true to size. Made an adult hat and it barely fits my 3 year old. Would be nice to have a gauge to check before starting. I'm so sorry that your hats are turning out too small. I do crochet loosely and I'm sure that is the problem. I am now adding a gauge to this pattern. Please check that out at the beginning of the pattern. Again, I apologize for the problems you've been having.